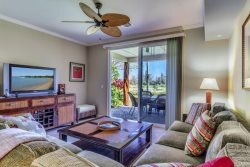 Waikoloa Fairway Villa L4 is an exceptional getaway with merged indoor/outdoor living spaces. The location of this 3 bedroom/3 bath townhome is perfect for up to eight guests; steps from the photo-inspiring infinity-edge pool, hot tub, central BBQ area, upgraded fitness center, social room with sharing library, game table. Waikoloa Faiway Villas L4 includes Waikoloa Beach Resort Gold Membership Golf benefits (discounted tee fees at the Waikoloa Beach Resort Courses). Fees are $50.00 per person, per round at the Kings Course and $75.00 per person, per round at the Beach Course. Instructions for using this privilege will be sent after reservation is confirmed. The main living area boasts an open floor plan, making the home perfect for entertaining or relaxing with family and friends. The living room has a 60 inch flat screen TV to enjoy. The kitchen is fully-appointed and there is a dining table with seats for six and four additional seats at the breakfast bar. A large wrap-around lanai is accessed from the living room or the dining room, with patio table with seating for six and 2 lounge chairs to view the amazing pool. Relax and unwind in the master suite that features a king-size bed and a 55 inch flat screen TV. The master bath is spacious and offers dual sinks, walk-in shower and a bathtub. Two additional bedrooms; one; downstairs has two twin beds and a private bathroom in the hallway and offers a 32 inch flat screen TV with a DVD player, the bedroom upstairs offers a queen-sized bed with attached bathroom with a 42 inch flat screen TV. The loft area offers a queen size sleeper sofa and reading area. The loft does not offer a TV but offers that perfect place for relaxing down time. Also included is; basic cookware, dishware, drinkware, coffee maker, Keurig coffee maker, blender, toaster, rice cooker, washer/dryer, hairdryer(s), bed and bath linens, iron and ironing board, central air-conditioning, free wireless internet service, basic cable TV in all rooms, DVR in living room and phone for US calls. There is plenty of beach gear; beach chairs, boogie boards, cooler and umbrella as well as beach towels for your use.